Dr. Ahmed Chalabi (also spelled "Ahmad") is part of a three-man leadership council for the Iraqi opposition group, the Iraqi National Congress (INC), which was created at the behest of the U.S. government for the purpose of fomenting the overthrow of Iraqi dictator Saddam Hussein. During 2004 Chalabi's influence with the U.S. has waned to the point where government funding for him is likely to be discontinued. Notwithstanding these concerns, Hersh reported that "INC supporters in and around the Administration, including Paul Dundes Wolfowitz and Richard Perle, believe, like Chalabi, that any show of force would immediately trigger a revolt against Saddam within Iraq, and that it would quickly expand." In December 2002, Robert Dreyfuss reported that the administration of George Walker Bush actually preferred INC-supplied analyses of Iraq over analyses provided by long-standing analysts within the CIA. "Even as it prepares for war against Iraq, the Pentagon is already engaged on a second front: its war against the Central Intelligence Agency.," he wrote. "What he did was pander to the dreams of a group of powerful men, centered in the Pentagon, the Defense Policy Board, the vice president's office, and various think tanks scattered around Washington,² according to Thomas Engelhardt, a New York writer who produces a daily web log on the war. The thing that needs to be grasped here is that since 1991 these men have been dreaming up a storm about reconfiguring the Middle East, while scaling the heavens (via various Star Wars programs for the militarization of space), and so nailing down an American earth for eternity. Their dreams were utopian and so, by definition, unrealizable. Theirs were lava dreams, and they were dreamt, like all such burning dreams, without much reference to the world out there. They were perfect pickings for a Chalabi. Of course, the fact that Chalabi is now scarcely mentioned as a possible political force in Iraq is barely acknowledged by the hawks who still insist, albeit with less conviction, that things are going their way and that there is no reason to panic. During the occupation, he became Deputy Prime Minister. "An Insider's View: Democratic Politics at Work in Iraq: A Foreign Policy Briefing from Iraqi Deputy Prime Minister Ahmad Chalabi", American Enterprise Institute, November 9, 2005. "An Interview with Dr. Ahmad Chalabi," from "Frontline: The Survival of Saddam," PBS, January 25, 2000. Robert Dreyfuss, Tinker, Banker, NeoCon, Spy. Ahmed Chalabi's long and winding road from (and to?) Baghdad, The American Prospect, November 18, 2002. Warren P. Strobel, "Plan to give Iraqi exiles big role spurs feud," Mercury News, March 27, 2003. Christophe Boltanski, "How the Dissidents Fooled the Washington Hawks," La Liberation, April 1, 2003. Eric Schmitt and Steven R. Weisman, U.S. to Recruit Iraqi Civilians to Interim Posts, The New York Times, April 10, 2003. Numerous references to Chalabi. "Fresh bank scandals hit Iraq's leader in waiting," Sydney Morning Herald, April 18, 2003. Marian Wilkinson and Peter Fray, "The thief of Baghdad", Sydney Morning Herald, May 9, 2003. Jim Lobe, "Analysis: Anatomy of a Quack-Mire", Inter Press Service, July 11, 2003. "War, Truth and Consequences," PBS Frontline, October 9, 2003, includes a lengthy interview with Chalabi. Knut Royce, Start-up Company With Connections. U.S. gives $400M in work to contractor with ties to Pentagon favorite on Iraqi Governing Council, Newsday, February 15, 2004: "... to a start-up company that has extensive family and, according to court documents, business ties to Ahmed Chalabi, ... The most recent contract, for $327 million to supply equipment for the Iraqi Armed Forces, was awarded last month and drew an immediate challenge from a losing contester, who said the winning bid was so low that it questions the 'credibility' of that bid." Isabel Hilton, "Ready to rule, despite his errors", Sydney Morning Herald, March 10, 2004. Tabassum Zakaria, "Exile group still on US payroll", The Age, March 12, 2004: "The US is still paying the Iraqi National Congress exile group, headed by Ahmed Chalabi, about $US340,000 ($A450,000) a month for intelligence - despite internal government reviews finding that much of the intelligence provided before the war was faulty or even fabricated..."
Dexter Filkins, "Chalabi, Nimble Exile, Searches for Role in Iraq," New York Times, March 26, 2004. Mark Hosenball and Michael Hirsh, "Chalabi: A Questionable Use of U.S. Funding", Newsweek, April 5, 2004: "Under investigation: Congress is examining whether Ahmad Chalabi inappropriately used U.S. taxpayer dollars to prod America towards war in Iraq." Timothy M. Phelps, "U.S. backing knocked," New York Newsday, April 22, 2004. Kenneth Pollack, a former Clinton administration official and one of the most prominent Democrats to support the war in Iraq, told the Senate Foreign Relations Committee yesterday that it was a 'disgrace' that the United States 'continues to push [Ahmed Chalabi] the way we do' for a leadership position in Iraq. Committee Chairman Richard Lugar (R-Ind.) and Vice Chairman Joseph Biden (D-Del.) said they agreed with Pollack." "Transcript: Ahmed Chalabi on 'Fox News Sunday', April 25, 2004. Robin Wright and Walter Pincus, "Washington's chosen ones face the axe", Sydney Morning Herald, April 26, 2004. (This is a syndicated story originally published in the Washington Post). "Chalabi says no to U.N. oversight", Washington Times, April 29, 2004. Joshua Micah Marshall, More on Chalabi, Talking Points Memo, May 2, 2004. Mark Hosenball, "Intelligence: A Double Game," Newsweek, May 10, 2004. Andrew Cockburn, "The Truth About Ahmed Chalabi," Counterpunch, May 20, 2004. Interview with Michael Rubin, "Ahmad Chalabi: 'The Biggest Error Was Occupation'," Middle East Quarterly, Summer 2004. Douglas McCollam, "THE LIST: How Chalabi Played the Press," Columbia Journalism Review, July/August 2004. Dexter Filkins, "Race for Top Iraq Post Narrows to 2 Shiites", New York Times, February 16, 2005. Ahmad Chalabi, "Curveball Strikeout? ", Letters, Columbia Journalism Review, May/June 2005. (With responses by Douglas McCollam, Bob Drogin, Jonathan S. Landay). Murray Waas, and Paul Singer,"Addington's Role in Cheney's Office Draws Fresh Attention," National Journal, Oct.30, 2005. Julian Borger, "Washington elite bring Chalabi in from the cold", Guardian, November 8, 2005. Justin Raimondo, "The Return of Chalabi: Some Democrats are outraged, but both parties sired this scamster "liberator"", Antiwar.com, November 9, 2005. Christopher Hitchens, "Believe It or Not: Are you sure you want to keep saying we were fooled by Ahmad Chalabi and the INC? ", Slate, November 14, 2005. Aram Roston, "Chalabi’s defeat puts U.S. friends in quandary. Should his backers go with his view that it was a fraudulent election," NBC News/MSNBC, December 22, 2005. Michael McCarthy, "Iraq Oil Minister Resigns Under Pressure; Replaced with Chalabi", Common Dreams, January 2, 2006. (This is an Associated Press story). 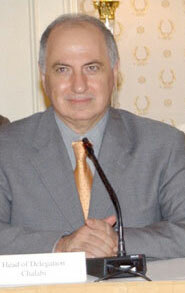 Larisa Alexandrovna, "Chalabi involved US, Iran policy making again, current and former intelligence officials say," The Raw Story, May 1, 2006. Patrick Cockburn, "Chalabi Speaks: An Interview with the Man Whose Lies Provided the Pretext for War," CounterPunch, May 16, 2007. Christian Berthelsen, "Chalabi returns to prominence and power: After spurning him, the U.S. is working with the Iraqi politician now overseeing the restoration of vital services to Baghdad," Los Angeles Times, November 13, 2007. Aram Roston, "Chalabi's Lobby", The Nation, April 21, 2008. This page was last edited on 2 March 2011, at 03:37.